A few days ago Office Hero, a new and independent stationery and office supplies company, sent me their catalogue together with free samples of four of their products for review. These products include a really nice ruler from Denmark, two different kinds of pencils and a notebook. After having had a look at their web site I was impressed by the fact that they stock many of the nice, specialist items that are not easy to get, like Linex products or, my favourite, the Velos Eyeletter. One thing to note is, however, that the prices displayed don’t include VAT, which is useful if you are buying commercially, but private customers from the EU have to pay 20% VAT for most items1. I was most impressed by the aluminium ruler I received and planned to review it first, but it is a ruler that can be used for pens and for cutting and unfortunately I wasn’t able to find my craft knife yet, so I’ll start with the notebook and hope I’ll find my craft knife to test cutting with this ruler before writing about the ruler. 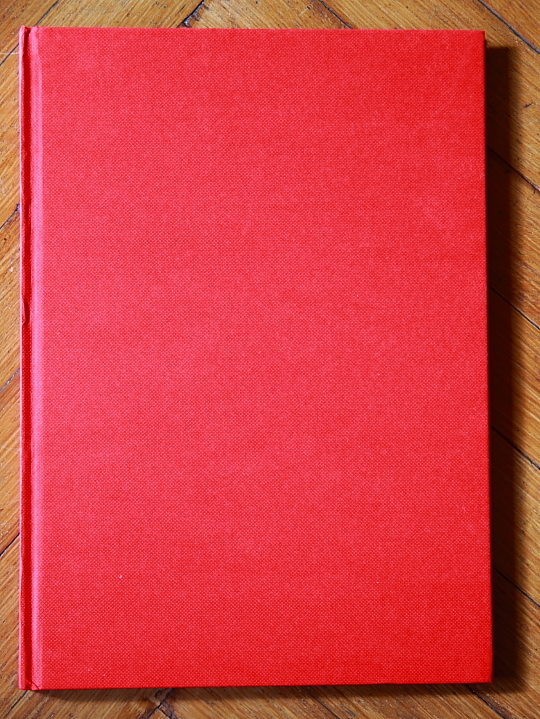 The White Box Manuscript Book has a very nice, red surface and about 80 pages. 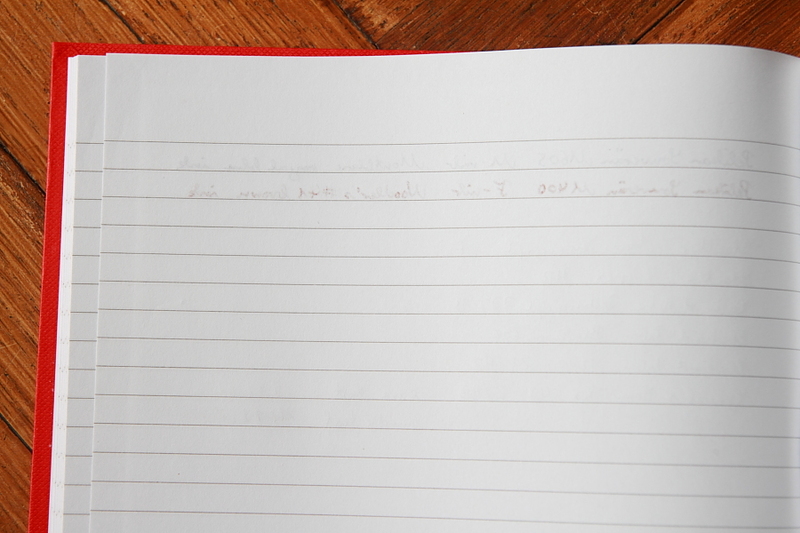 It is a ruled notebook, but the strength of the lines varies quite a bit on different pages. The paper is very good. It copes well with many inks and I only noticed bleeding through with some inks and only when being used in combination with very wet nibs. The paper’s attributes are, with one exception, great for graphite, too. First the positive bits: the graphite doesn’t transfer easily to the next page, even after pressure has been applied from the back (e.g. after writing on the back). It also copes well with erasers. The only problem I noticed is that some of the softer leads smear more than on many other papers, in the example on the photo you can see this with the General’s Semi-Hex pencil. The most impressive thing about these is however their price. They are currently on offer and a pack of five notebooks is only £4.07, that’s £4.88 incl. 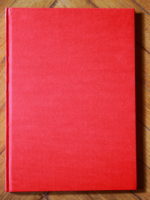 VAT (~$7.65; €5.55) – less than £1 for one A4 notebook. Great value for money, at least while they are on offer, and very nice paper that feels good and that copes well with ink and graphite. Price and exchange rates: October 2011. David from Office Hero and Oliver Carding from Sagittarius Digital for the free samples. I am very embarrassed, but I am not sure who gave me the General’s Semi-Hex pencils tested on the paper – even more so because I use one in the office very often. Whoever gave it to me, thank you! Office Hero also included a leaflet with the samples: if you enter the code “BROCH1” when you order you get a brochure and 5% off with your order. Thanks for this post — they look like very nice notebooks. I’m particularly interested in the ruler you were speaking about. There is one company that makes them, C-Thru, but they’re not very good. You can’t find any of Faber-Castell’s precision and drafting products in the U.S. Well, at least I can’t. I’m not too confident I’ll find the craft knife and the cutting board. I haven’t seen them since we moved home… If I don’t find them I’ll review the ruler based on its pencil merits alone. 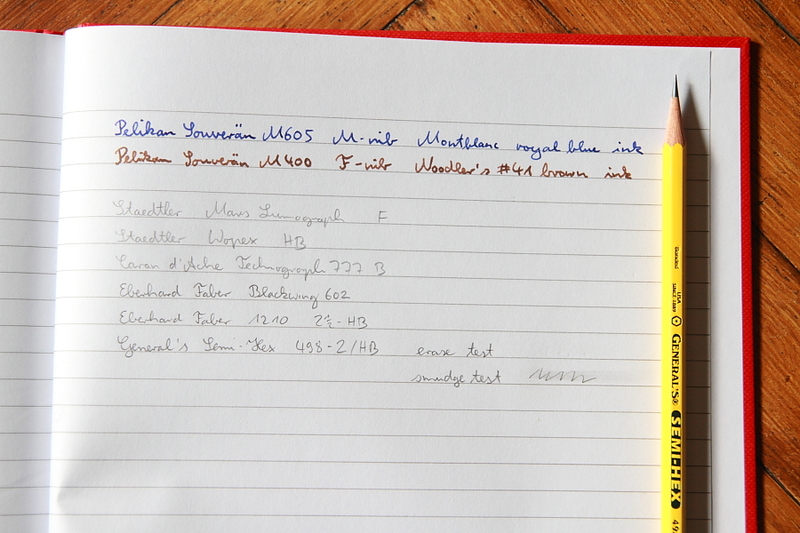 The Faber-Castell ruler you mentioned does look very nice! I don’t remember ever seeing it in shops though. Hen, the Semi-Hex was sharpened using the Deli pencil sharpener 0635. I think the Semi-Hex in the photo was from Sean or Adair. The General’s pencil I got from you with the USA Kit was General’s Carbo Weld Supreme 22/4 (which looks older than the Semi-Hex, but I am not sure whether it is really older), a nice pencil that I remember as having a harder lead than the Semi-Hex.